What’s not to love about a holiday completely dedicated to eating? It’s the best! Thanksgiving makes me feel some type of way. But I don’t always love the way I feel after a weekend spent gorging on too much sugar, butter, carbs and wine. It feels so good in the moment – and I’m all about living in the moment – but sometimes it leaves us feeling less than our best when its all over. To make up for the overindulging I did this weekend, today I’m going to make a big green smoothie, take a long jog and then dive face first into this salad. It’s super bright and colorful and just looks like the picture of health. 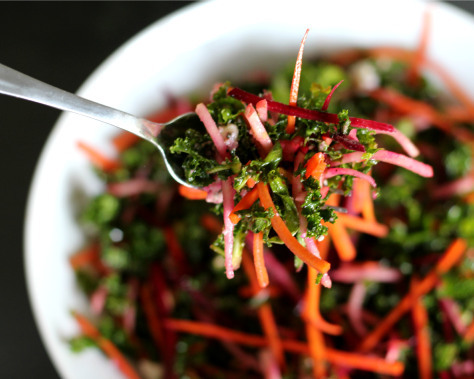 With lots of raw veggies like kale, carrots, apples and beets, it really packs a nutritional punch. But! It also tastes rich and indulgent from the walnuts, dried cherries and blue cheese. 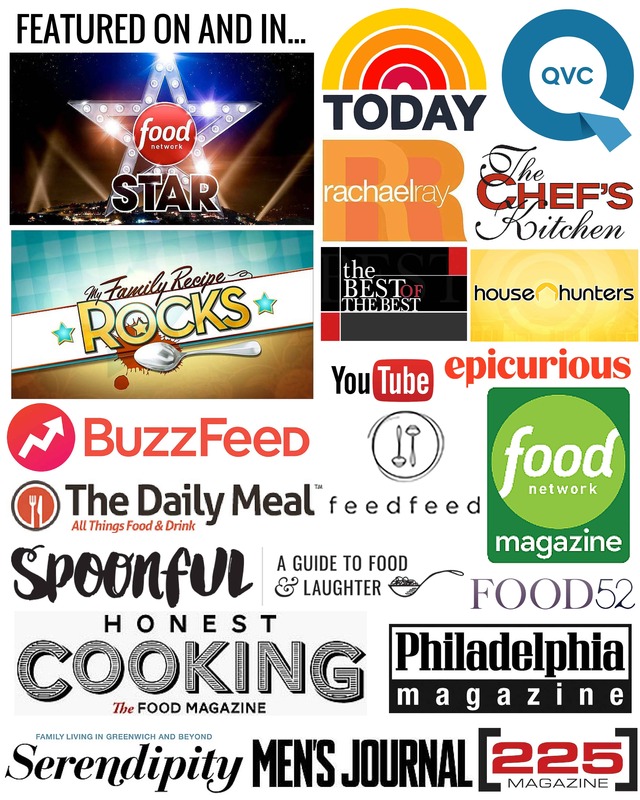 Because lets face it, this is December not June, and we aren’t exactly craving fresh light fare these days. This salad hits all the marks! I’ve been making different variations of this salad ever since my sophomore year in college (aka a really long time ago) when my parents and I took a trip to Scottsdale, Arizona to visit family friends Tom & Julie Cook. One day for lunch, Julie made us a salad that had apples, blue cheese, nuts and dried cranberries. I absolutely fell in love with it, and when I returned home, I made that salad almost every single day. My Mom and I nicknamed it a “Julie Salad,” and she got a kick out of how often I was making it at school. I’ve often wondered if Julie ever knew how her humble lunch created such a legacy in our household (and in my diet). I’ve reincarnated this salad into a million different versions over the years, simply by changing up the produce, dressings and accoutrements. But the base flavors stay the same: greens, crisp fruit, nuts, dried fruit, and tangy cheese. With the holiday season now in full swing, cookies and cocktails will be taking the wheel for the next month. And for the record, I’m completely okay with that. 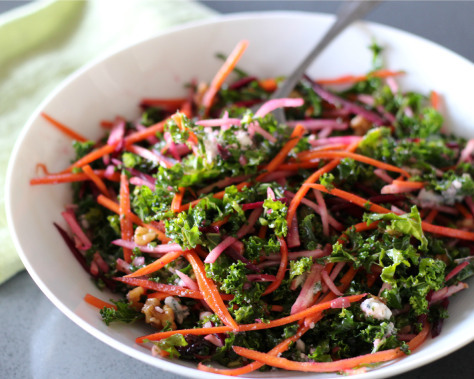 This little detox(ish) salad can be your secret weapon to keep you feeling on top of your holiday game. But of course it’s not too detox-ey, because, you know, this is still a time to be festive and indulgent. Lots of raw cruciferous veggies to give your body a tune-up, but enough cheese and nuts to keep it from tasting like its really good for you. Look at us! Being all healthy in December. We’re so ahead of the game. Waiting until January to think about health is so 2013. High five! Life’s all about balance. Have pie and champagne for breakfast one day, then jog and eat kale the next. It’s been working for me so far, and I’m fairly certain both my Mom and Julie would agree. 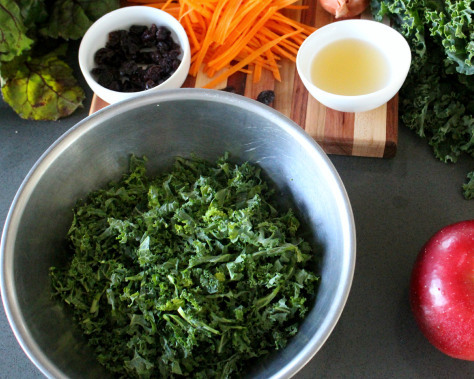 Gather the kale into a tight bunch and slice into thin ribbons. 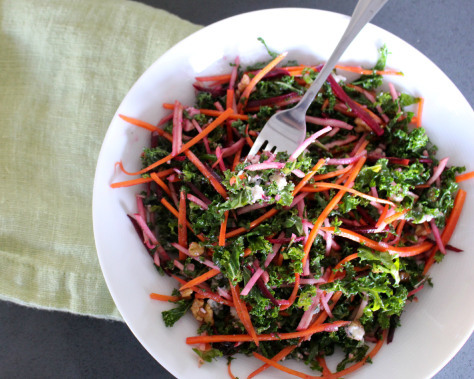 Place the shredded kale into a bowl, drizzle with a little olive oil and a pinch of salt. Use your hands to get in there and massage the leaves. That's right, massage it! 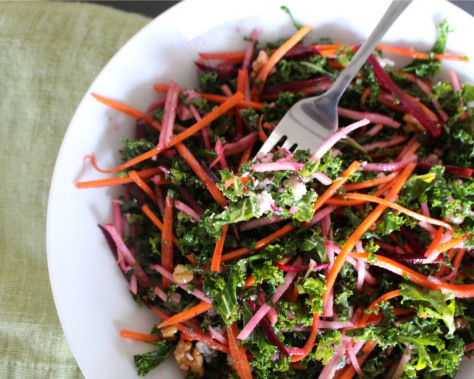 This helps to break down the fibers in the kale, making it softer, tastier and easier to digest. 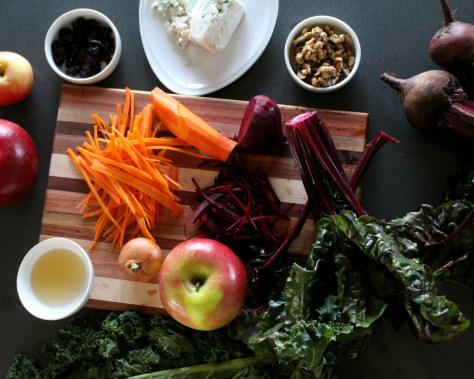 Add the beets, carrots, apples, walnuts, and cherries to the bowl. Crumble in the blue cheese. To make the dressing, whisk together the apple cider vinegar, honey, salt and pepper until the honey is dissolved. Slowly whisk in the olive oil until it's emulsified. Pour the dressing over the salad a little bit at a time and toss until it's coated to your liking. I take mine lightly dressed, while Chaser likes his drowning, so I always leave a little dressing on the side. Serve immediately, or store in the refrigerator for up to one day. It won't be quite the same as fresh, but it holds up far better than most salads. I really like the texture achieved from julienning (non-intended pun, I swear!) the vegetables, as the thin matchsticks create such a pleasant crunch. I use the julienne tool on my mandolin slicer to make it quick and easy, but you can also do it by hand. If it seems like too much work, you can just slice the vegetables nice and thin or cut into cubes. Just be sure to keep the beet pieces extra skinny, as they can be a bit much to chomp into. To make this salad vegan and even healthier, just leave out the cheese. But personally, I never leave the cheese out of anything. You really are good at coming up with names for things…. Too funny just finished making the same salad for dinner but I perfer pecans and homemade balsamic dressing. I’m serving mine with steak because the family won’t let me get too healthy on them. I must tell you that I’ve always love kale – way long before it got groovy and hipsters started eating it. But I love it even more now since I started using your EVOO massage method. Great tip. Keep ’em coming. And a timely recipe since I finally quit smoking (after 50 years!) and I’ve now got six or eight extra pounds to get rid of by NYE 2015. This will help! I too know Julie & Tom Cook and absolutely am a great admirer of hers. Shhh, she doesn’t know. 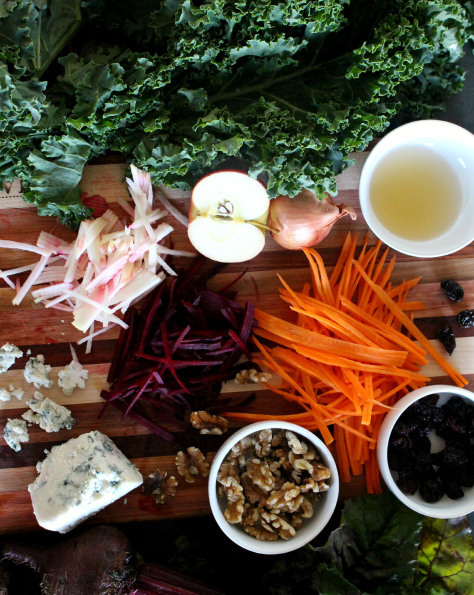 I will be making this salad and it will be my first time dipping my food into the kale pool. Look-out below! !